It looks like the Steelers are going to the Super Bowl again but that's not why I'm writing this. Back in October 2004 Chris Anderson, editor in chief of Wired Magazine, published an article and referred to something he called The Long Tail. In 2006, Chris expanded on his article and published the book The Long Tail: Why the Future of Business Is Selling Less of More. In both the article and the book Chris explains how the Internet enables businesses to sell a large selection of goods in small quantities to a large population of customers at minimum cost. Selling online extends the life of digital content almost infinitely. This makes sense - think about your favorite song or television show when you were a kid. The next time you're at your local WalMart look around - think you'll find that song or every (or even any) episode of you favorite show? Probably not. Chances are you'll find it and will always be able to purchase it somewhere (iTunes, Amazon, etc) on the web - that's the Long Tail. So back to my title..... what do the Pittsburgh Steelers and Polka music have to do with Chris Anderson and the Long Tail? In the 1970's my in-laws, polka musicians Happy Louie and Julcia, recorded a song titled The Pittsburgh Steelers Polka. It pretty much sat on the shelf for the past 30 years or so - they'd sell a few albums here and there with the song on it. A little over a year ago Louie and Julcia began putting their songs up on iTunes and more recently Amazon. Fast forward to today - the Steelers song has gone viral. 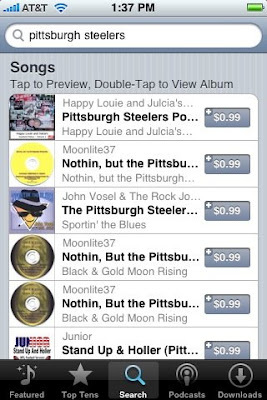 A search of the Pittsburgh Steelers on iTunes brings The Pittsburgh Steelers Polka up as number one on the songs list. Another search of the "World Genre" Top Ten in iTunes brings The Pittsburgh Steelers Polka up as number 6. You can listen to a portion of the song on YouTube here. If you want the whole song you can get it on iTunes here or on Amazon here. Great example of the Long Tail! I'll link back to your post as I begin blogging about Anderson's work (one of my favorites!) at http://www.academicevolution.com. Gordon, This is awesome, I grew up near Pittsburgh in the mid-70's and we'd hear that song every year. What a small world and thank your inlaws for me...awesome!!! That's great Karl - will let them know. Go Steelers! Gigonomics: The New Workforce Model? Digital TV - Maybe Not Next Month? AT&T 2G Network Services Changing?